When do bacteria decide to cooperate? Bacteria don’t think since they’re just single celled organisms. But they do make decisions. Take the lac operon, arguably the best studied molecular system that enables an organism to adapt to changing conditions. When bacteria have plenty of a nutrient that they like, glucose, they don’t express the genes to eat up another nutrient that they like less, lactose. When glucose runs out, glucose starvation sends a signal as a series of molecular processes inside the cell that end in the expression of the genes in the lac operon. The enzymes encoded in those genes help the cell break down lactose into glucose and galactose and the cell is happy again. The lac operon is a cellular decision-making system, but one that is pretty individualistic. When a cell makes a decision to express genes based on whether it lacks a nutrient, the decision affects that cell first and foremost (even though decisions to eat new sugars from the environment can always also affect others that compete for the same food). But bacteria can make decisions that are more social. In our lab we study how cells make decisions to cooperate with other bacteria. Bacteria have many collective traits like biofilms and swarming, which can only happen when there are many cells in a community. One thing in common for these traits to happen is that many individual bacteria need to come together and start producing substances that accumulate in the extracellular space. To build a biofilm, bacteria must secrete large amounts of polymers and make an extracellular matrix. In order to swarm, bacteria must secrete lots of rhamnolipid surfactants and lubricate the surface of a Petri dish. Each cell must spend resources to produce their individual share of a common good. Without these individual contributions the social trait could happen. Cheaters within the population (like the rhlA- strain in this picture) could take advantage of the public good without themselves contributing. How can cooperating cells prevent cheating? One way is to invest in cooperation only when there are plenty of resources to do so. 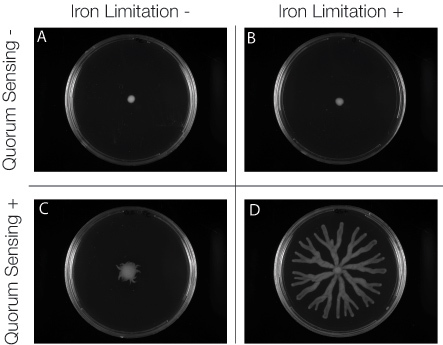 We uses quantitative experiments and mathematical modeling to analyze how bacteria do this. We saw that bacteria decide to express genes to make the surfactants needed to swarm when they have more than enough carbon rich nutrients, a process that we call metabolic prudence. However, they also count their neighbors using a process called quorum sensing. This way, each individual bacterium checks if it has enough nutrients and enough neighbors for swarming before cooperating. At any point in this process, if the bacterium gets starved too severely it shuts down cooperation, possibly to dedicate resources in preparing for survival. 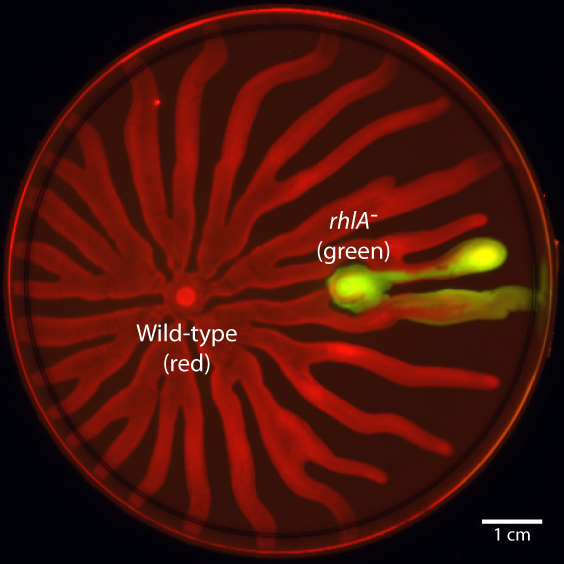 Check out our paper, out this week in PLoS Computational Biology.